Some things I have always found hard to resist, and most of my food memories growing up involve my Nan in some way or another. It is not necessarily the variety of the food, most of it was very traditional – e.g. meat, potato and veg sort of affair – and even pasta would be considered exotic. The thing was it always felt homely and always properly cooked. My parents considered me a fussy eater as a kid, I tend to thing that I just do not like badly cooked food and that was the case when I was young too, but my nan got me eating things (basically green veg) without so much hassle. I think I’ve mentioned before that she used to send me Welsh Cakes to me in the post whilst I was a student; they were always a great treat and something that never used to last long with either me or my housemates. But my favourite thing I’ve always got from her, and she always makes me one whenever I come down and see her, is Bara Brith. It is supposedly translated to ‘Speckled Bread’ and is a type of tea cake. It could be said that it is a variation on a Selkirk Bannock cake but it doesn’t have butter or milk in it, and likewise the Bannock isn’t soaked in tea or use eggs. 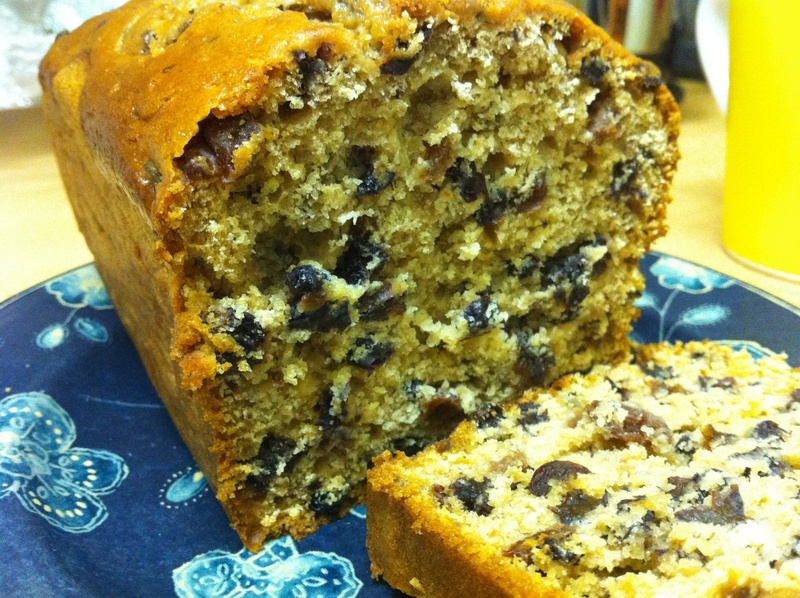 Bara Brith originated, or so the story goes, from adding fruit to the surplus bread dough when baking once a week. Some also say that there are South and North Wales variants, I slightly disagree with this, but it is certainly true that the adapted recipe that my nan uses does originate from South Wales as way to bake the cake without using yeast to make it easier for industrial (i.e. miners) families to bake it. I think I actually prefer it this way too because it makes it a lot more richer. 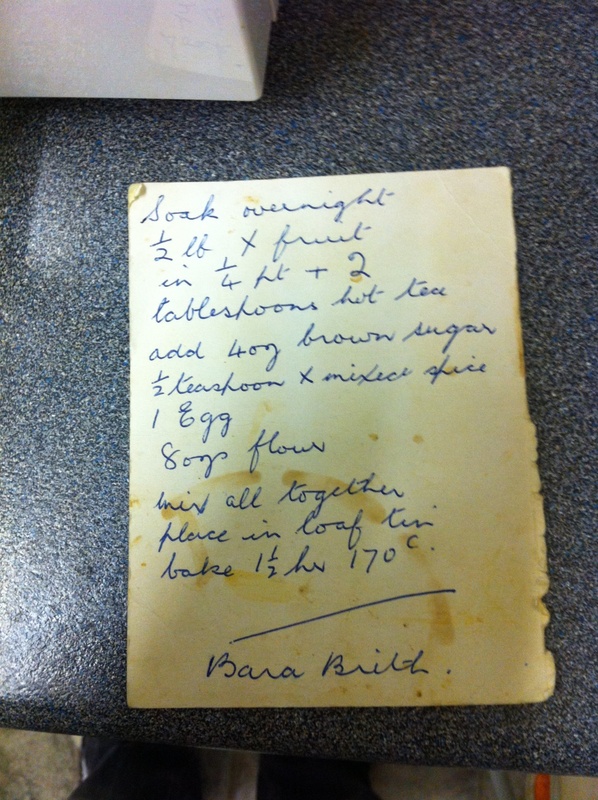 I am not sure whether there is any sort of originality in this recipe, I certainly know it is old, but how old I am not sure. To quote my Nan (yes, she did say that): “I got it from Mrs Jones, who used to live on Llandaff Road, a long time ago.” I am probably certain it is from either the late forties or early fifties when my grandparents used to run a grocery shop, as this was typical of the stories she used to tell me from those days. It is a simple recipe, but simply delightful. Mix all the above ingredients into the soaked tea and fruit. Grease a tin loaf (you may use parchment paper too) and preheat the over to 170°C. Add all the combined ingredients to the tin loaf and bake for one and half hours, ensuring that a knife can come out clean if inserted into the cake. Slice and serve with butter, with a pot of tea. Soft, chewy, salty. Perhaps with a little mustard. Actually maybe not. That’s a New York thing, and it’s probably French’s. It’s a rather bright yellow, that makes me wonder whether it is a little toxic. Of course it’s not, it is just the vinegar, but it is a little unnerving. Mustard or no mustard, sometimes there is only one thing I want to do for lunch: Walk the 10 minutes up the hill from my office to Falko‘s and stock up on his lye bretzel. I think it is one of the reason’s why I have failed to detach myself from my current workplace, or at least find a job that still makes it within walking distance. A bad morning can often be solved with a gentle stroll up the hill and immersing myself into some German bread. The array of cakes are second to none, and the marzipan almond horseshoes are so delicate and sweet, they make you crave for more (and perfect with a cup of tea). But I digress, it’s the only place I have found in Edinburgh that sells fresh pretzels, yet it surprises me that they are not more readily available nor there be the demand f or them. They appear at the German market at Christmas, but the tradition has never really caught on. I adore making my own, I even import the flour and yeast from a Jewish shop in North Carolina, yet there is still something missing. I think even the Pretzel M&M’s that you can now get (a low-calorie chocolate? Crunchy, salty, sweet? ), and act as the perfect accompaniment to an IPA, imply there is something else I should be doing, but what is it? Walking round New York or Chicago (probably most N.E. 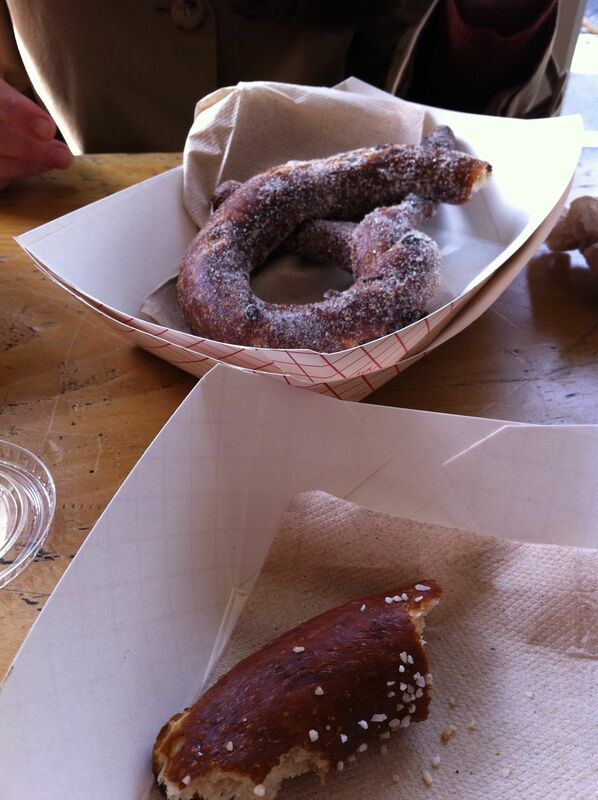 cities) pretzels are ubiquitous as the falafel vendors. The German immigrants (well the Pennsylvania Dutch really) of the 18th century first brought the delicacy to the US, and the eat about a kilo’s worth a year. That’s probably about 200. On a recent visit to NYC, I literally dropped my bags off at the hotel and headed to Sigmonds Pretzel Shop in the East Village. I stumbled upon it trekking around, because of their unbelievable quality. I think that’s where the mustard comes in because, for the most part, most street vendor pretzels just taste liked undercooked bread. The reason ‘real’ pretzels taste so different is because they use Sodium Hydroxide, instead of Sodium Carbonate – and this is the thing I have been missing. Sodium Hydroxide is a caustic soda which can burn and you need a mixture of about 3% in water. It is more commonly referred to as lye, and makes great pretzels because it breaks down the gluten and on the outside of the pretzel which causes the starch to harden giving it its crust (it mixes with Carbon Dioxide as it bakes to form Carbonate), whilst keeping the middle moist. The shape depends on whether you are eating a Bavarian (which is uniform in size) or a Swabian which is big in the middle and thin at either end. Sigmond’s are Bavarian, and Falko’s Swabian. A perfect combination for two great cities.